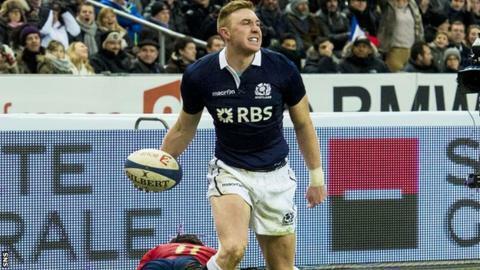 Dougie Fife does not believe the defeat to France will derail Scotland's bid for a successful Six Nations campaign. Vern Cotter's side lost 15-8 in Paris on Saturday but try-scorer Fife is already looking ahead to facing Wales at Murrayfield on Sunday. "We had the belief, we had a great autumn and thought we were rolling into the start of this campaign in a good place," the winger told BBC Scotland. "I think we are and there's a big game next week to get us back on track." Five Camille Lopez penalties were enough for the French in the sides' opening match of the campaign. Scotland had moved to within a point at 9-8 behind following Fife's try, but Greig Laidlaw's conversion attempt came back off the post. And Edinburgh star Fife knows the Scots did not play to their full potential, despite head coach Cotter's best efforts. "It's very disappointing the way we didn't get the result, we felt we could've got it," the 24-year-old added. "It could have gone either way in the end and it was pretty disappointing. "Vern's very clever, he knows what the opposition is going to bring and how we're going to get around it. "I thought the game plan went well, at times in the second half we maybe got a bit lost and we needed to play a bit more in their half, but every day we're going to be improving and next week we should be back on form." Fife was an early replacement for Tommy Seymour, who picked up a hip injury and will need further assessment ahead of the clash with Wales. Mark Bennett, Geoff Cross, Alex Dunbar, Robert Harley and Alasdair Strokosch also picked up knocks in Paris. "It's a talented squad," Fife added. "We have great wingers and good competition, and hopefully I've done enough [to stay in the side] but who knows? Fingers crossed."